Tom really wanted to manage The Rolling Stones, but the people and clients at TeamWorks will do. Tom spends his time at TeamWorks Media making sure everything runs smoothly – finance, HR, legal, business affairs, and the Internet connection too. He’s also good listener if you’ve got a random issue. 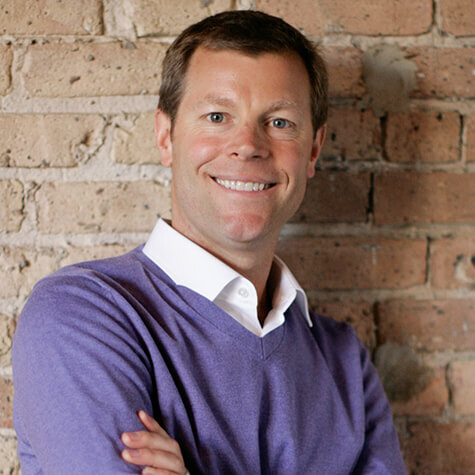 With 25+ years of marketing and PR experience under his belt, Tom helps with new business development, client strategy, and execution of his favorite TeamWorks projects like the Bank of America Chicago Marathon and anything involving his alma mater Northwestern University. Tom’s career began with one of the greatest Chicago jobs of the 20th century: manager of media services for the six-time NBA Champion Chicago Bulls. If you wanted to talk to Michael Jordan, Dennis Rodman or Phil Jackson during the Bulls 1990s dynasty, you had to go through Tom. Yes, he has a million good stories. Away from the office, Tom’s passion is running and music. He’s completed 14 marathons, even qualifying for the Boston Marathon back in the day. He’s also an accomplished drummer and an aspiring guitarist with a dream to be a rock star before it’s too late (um, it is). But his real passion is family – he lives in Chicago with his wife Colette and six-year old twin boys Will and Teddy. Tom hasn't written any posts.